We musicians spend so much time practicing that it’s wise for us to optimize the spaces where we practice. Here are two ideas for doing so. 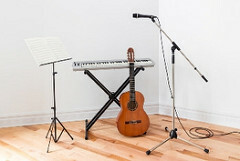 How can ill-equipped practice rooms leave musicians floundering? Poorly sized chairs contribute to backache; dim lighting provokes eye strain; missing metronomes can give rise to a distorted rhythmic sense. You see what I mean. Here’s an inventory of 12 essentials, aside from an instrument, for setting up a practice space. Bear in mind that some musicians won’t need all of the items listed. Few pianists, for example, require electronic tuners. To transform your practice space into a creative temple, designate it as such every time you work. When you prepare to practice, wherever you may be, make sure that your equipment needs are met and that your materials are in order. At the same time, remove distractions: switch off the phone; put the computer to sleep. Next, take a minute to acknowledge the extraordinary opportunity before you to make music. Just as religious devotees may perform rituals when entering houses of worship, adopt pre-practice customs. Prior to your musical warm-up, breathe, release tension, and affirm the value of your artistic work.